Installation of cell service equipment and necessary maintenance work will take place this weekend on the Red Line. This will require a full track closure, with bus shuttles replacing trains between Vermont/Santa Monica and Hollywood/Vine Stations. From Saturday, March 11 start of service through Sunday, March 12 close of service, all westbound Red Line trains will travel as far as Vermont/Santa Monica and turn back towards Union Station. The last stop for all eastbound trains will be Hollywood/Vine Station. From there, trains will turn back to North Hollywood. Red Line riders traveling between Vermont/Santa Monica, Vermont/Sunset, Hollywood/Western and Hollywood/Vine can board free Metro bus shuttles, planned to match rail service levels as best as possible. 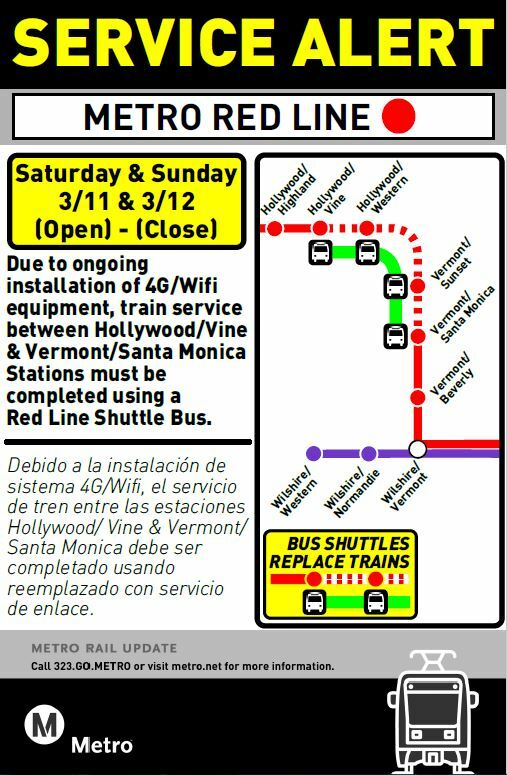 Bus shuttles will run between Hollywood/Vine and Vermont/Beverly on Saturday start of service until 9 a.m., then resume to the original bus shuttles locations throughout the weekend. Some customers may also want to consider Line 204 or Rapid 754 between Vermont/Santa Monica and Vermont/Sunset, or Line 217 or Rapid 780 between Hollywood/Western and Hollywood Vine to avoid transferring to Red Line bus shuttles. We realize the closure is an inconvenience for many and we appreciate your patience and understanding. Subway cell service work has been in progress for the past year and this weekend’s work will soon allow more customers to make calls and surf the web while riding below ground. Metro personnel will be on hand and happy to assist at all Red Line stations impacted by the work. Normal Red Line train service will resume on Monday morning. One of the issues in one of the service changes in the 2000’s was to eliminate any thru bus service on Hollywood Boulevard, with the exception of the 780 (which doesn’t run on weekends) and owl service, in the name of “eliminating duplication”. So the 217 ends at Hollywood and Vine coming from the west and the 180/181 ends at Hollywood/Vine coming from the east, forcing transfers at Hollywood and Vine for everyone. When will this be activated? After Vermont/Sunset was closed all weekend I expected to have cell service on Monday but nothing seems to have changed!! While the equipment will be installed after this closure, it still takes a little time for service providers to sign on. We expect to have service available later this year.